We’re fully into pumpkin season , which is especially joyous for beauty-lovers who understand the fruit’s skin care benefits. While I am game to eat everything made with the orange squash , it’s nice to take a food break and indulge in it calorie free by using it as part of my grooming routine. Because raw pumpkin contains high levels of vitamin A and natural enzymes, it can induce cell turnover when applied to the skin. The harvest fruit is also an antiaging rock star, as it is rich in essential fatty acids to regulate proper skin sebum production, diminish fine lines, and maintain the epidermis’s natural pH. Basically, if you want bright, healthy skin that also smells delicious, pumpkin will get you there. So when I learned that The Spa at SoHo Trump in NYC added a luxurious Pumpkin Body Polish Treatment ($195 for 60 minutes) to its menu, I was all in to test it. The treatment begins with a masseuse applying a pumpkin peeling enzyme mask all over your body. The mask contains 15 percent pumpkin extract, vitamin A, and hyaluronic acid, which all work together to detoxify and smooth out the skin. After a pumpkin enzyme body polish is scrubbed onto the body, you’re wrapped up while the masseuse does a mind-erasing scalp massage. You shower off and come back to the table to get a healthy dose of nourishing body cream rubbed into your baby-soft, glowing skin. I was delighted that my entire physique smelled like pumpkin pie for the next 24 hours, and the smoothness lasted for several days. While it’s not easy for everyone to make it to the spa (though I do highly recommend it if you’re visiting the Big Apple for the holidays), The Spa at SoHo Trump whipped up this exclusive pumpkin DIY scrub so you can try it at home! The mix also contains cold-pressed coconut oil (to moisturize, exfoliate, and offer antibacterial properties) and ground cinnamon (another antioxidant that also smells heavenly). Read on to learn the recipe. It’s officially pumpkin season ! Sure, you’re already hooked on pumpkin spice lattes and have made a date in your calendar to find the perfect jack o’lantern, but are you aware of the benefits that this iconic squash can provide to your skin? Packed with zinc, antioxidants, and vitamins, pumpkins protect your skin from wrinkles and age spots as well as gently exfoliating for a more radiant complexion. Don’t have a pumpkin patch nearby? You can get this orange fruit (yup, it’s a fruit!) in a can at your local supermarket. Apply: Smooth the pumpkin-y potion over your face, relax for 15 to 20 minutes, and rinse to reveal a brighter, firmer, smoother complexion. They say you haven’t made it as a star until you have a beauty campaign , which is why it’s such a big deal every time a new A-lister signs on to be the face of a brand. The fact that these models, actresses, and musicians also get stunning makeovers for the ads is just a bonus. If you’re as celebrity obsessed as we are, then help us track all the biggest 2015 beauty campaigns as they break! As if you weren’t already obsessed with Gigi Hadid, here’s another reason to love the blue-eyed bombshell. Apart from making a big name for herself on the runway, she’s also been killing the street style scene , and she does just that with these looks. For the fashion lover to the gal looking for real-girl outfits styled in the easiest way, take a tip from Gigi’s outfits here. They’re so jaw-dropping good, you’ll want to get your hands on every piece. Are you about to get an anxiety attack from all the products clustered around your shower? We hear you . . . Counter surface real estate is at a premium in the bathroom. Make the most of your space with a shower caddy! The convenience can’t be beat. You can rinse off all your products in one go (preventing gross mildew), everything’s easy to find, which is especially important for glasses wearers, and you can clean the shower instantly just by hiding the caddy in a closet. Even if you graduated long ago, the appeal of the shower tote is too strong to resist. That said, if you do have roommates, we recommend you find a safe place for your products when they’re not in use – the stuff we’ve picked for you is so good that people are bound to try borrowing. By now, you’ve definitely at least seen a sheet mask if you haven’t tried one. Your favorite stars have rocked the treatments in quick airplane selfies touting their fabulousness. Are they really as good as they claim? In a word: yes. The products are just one of the wonderful Korean beauty trends that have become mainstream stateside. Just slip one of the serum-infused cloths out of its packaging, apply it to your face, and go about your business. In less than the time it takes to watch an episode of Parks and Recreation, you’ll see a whole new complexion that rivals that of a beauty-entourage-armed celebrity. That said, there are so darn many of them, and benefits like “acne-clearing” or “antiaging” just aren’t specific enough for us. We’ve made it easier by finding the best sheet masks on the market, then broke down the real-life benefits so you can get the complexion of your dreams. Whether it’s treating ourselves like Tom Haverford or doing damage control on our screen-ravaged complexions, you’ll find it here. After a long, stressful day, we just want to tuck ourselves into bed and start counting sheep. But as the beauty girl in our group of friends, we have a certain level of grooming maintenance we must adhere to. Even our significant other would be concerned if we went a few days without a manicure (sound familiar?). While there is merit to staying up late to practice those superlong Korean skin care rituals , it’s sometimes relieving to try a lazy-girl hack before bed so that you wake up looking gorgeous. After lots of trial and error, we’ve found the best ways to maximize beauty sleep – just keep reading and try them tonight! While we’re clearly obsessed with learning everything about beauty, we’ll be the first to admit that the sheer volume of information can be daunting, and some important tips can get lost along the way. Are you using the right primer? Are you using bronzer correctly? And is powder really necessary? It’s easy to make some big makeup mistakes without even realizing it. Well, that stops now. If you’re always struggling to keep to your New Year’s resolutions, 2015 is the year that changes. Once you see which mistakes you’ve been making, you’ll swear to never make them again – after all, your beauty reputation is on the line. And don’t think that only beauty newbies are prone to errors! So read on: even if you’re a professional, you’re bound to pick up a new trick or two. Are You Making These 12 Perfume Mistakes? Pumpkin isn’t just for pie. When used in skin care, it helps boost cellular turnover to brighten your complexion – a bonus during dry Fall weather. Our top choices will leave your skin smooth, flake-free, and illuminated. 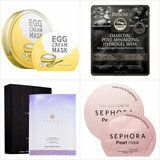 See what you’ll be picking up in today’s Beauty Review. On Kirbie: Kendra Scott earrings.